When I was in high school, during a weekend day trip to Skaneateles, my parents and I splurged on an evening meal at The Krebs. Then the jewel of fine dining in Central New York, The Krebs was venerable, but considerably less chic than I had expected for such a lauded dining establishment. 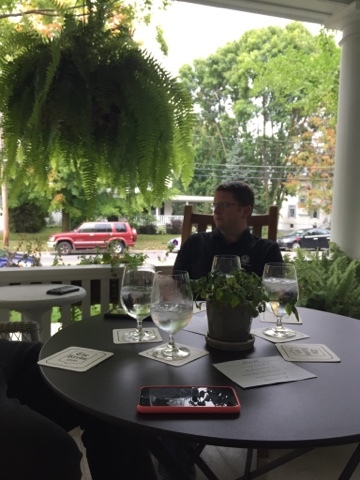 I don't remember what we ate, frankly, but I remember that the space had a country club feel, a relaxed and aging elegance that communicated old money rather than overt opulence. There's a gentility to the hamlet of Skaneateles that, even more than Saratoga Springs or Ithaca, smacks of generations of dynastic wealth and an unassuming comfort with the finer things in life. The Krebs of old was firmly ensconced in that oddly East Coast sensibility of rugged, relaxed luxury. What a difference a couple of decades makes. 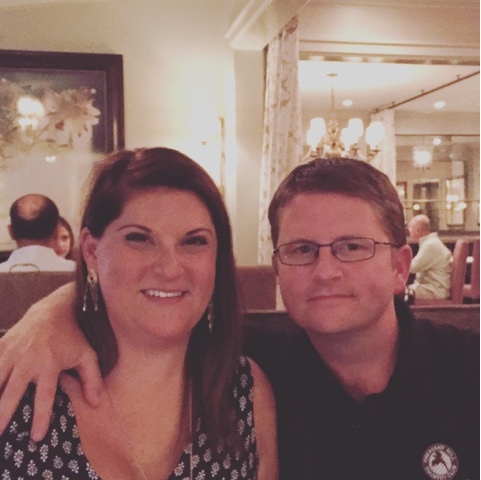 Today, The Krebs is owned by a millionaire and his wife who saved the restaurant, first established in 1899, and have turned it into a farm to table destination that donates all its net profits to local charities. A complete interior renovation has transformed the dining spaces and bar into a modern, urban example of luxe fine dining - a cocoon of glamour, though never over the top. The outside has been sprucedup, but not altered, so that the deep front porch still retains that hospitable, throwback, early 20th century feel - a wonderfully peaceful spot to sit and enjoy cocktails before your reservation. The cocktails themselves are a bit high in concept and low on delivery, for me. An autumn rum concoction sounded delicious, but was so overly spiced, it tasted like a mouthful of potpourri rather than a masterfully balanced tipple. A Bloody Mary martini should have tasted of the tomato infused into the alcohol, but instead was just a glassful of chilled vodka with little flavor. I respect strong drinks, but these two seemed to focus more on form than function. Neither was very drinkable. Things perked up with our starter course. 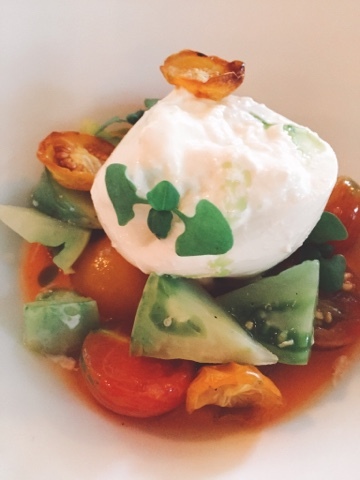 Late harvest tomatoes and burratta cheese were right up our alley. I was surprised that the tomatoes in question were grape and cherry rather than heirloom beefsteak varieties, as typically, you want less bitter skin and more sweet flesh to pair with the ultra creamy mozzarella, but the tomatoes were busting with sugary flavor. The cheese was almost more of a freshly handmade ricotta than a burratta - the focus was on the creamy, loose interior of this specialty food rather than a shell of chewy, sponges fresh mozz. It was sort of free form, and the cheese broke down quickly to create a sort of cheese sauce around the tomatoes. It was dressed in what the menu called botanical oils. I was missing acid - a little bit of vinegar would have been a welcome addition to this herbaceous, milky dish. Prawns with coriander, citrus, and espelette chile were much smaller than I assumed when ordered them. Shrimp and prawns are fairly interchangeable terms, but typically when featured on menus, prawns indicate a very large crustacean. 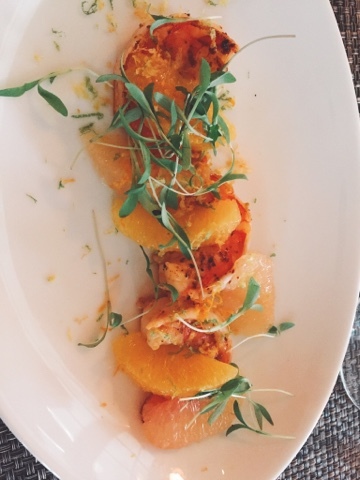 These were petite, but perfectly cooked, and bursting withfreshness, paired with supremed segments of orange and grapefruit, and lightly sprinkled with espelette chile pepper, which is a gently hot, slightly sweet spice. 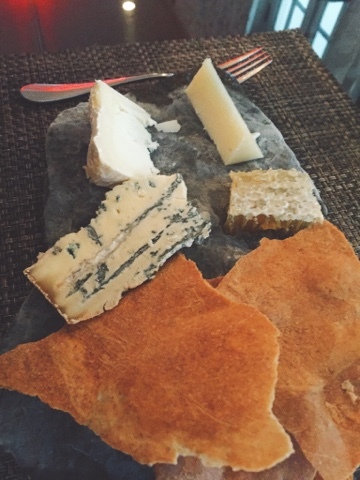 The Krebs menu doesn't specify what cheeses come on the $18 cheese plate, but we liked them all. The blue cheese, in particular, was sweet and savory - possibly a Gorgonzola? It was really lovely with smears of the gooey honeycomb served alongside. Shawn absolutely adored the crispy crackers that came with the plate, as well. This was not an especially plentiful amount of cheese for the price, but the quality was there all day. My favorite was the creme selection, which may have been a Camembert. The four of us dining were evenly divided on our entree choices: two chicken, two duck. The guys were very happy with the chicken, which was prepared sous vide, or cooked in a sealed bag inside a bath of temperature controlled circulating water, low and slow, to retain all its moisture. The skin was removed and fried separately, to render it crispy and crunchy. Yum! The plate was completed with some celery and a chicken jus, which was subtle - the star here was the juicy meat and salty, crisp skin. Melinda and I chose the duck, because we are wise. The menu claimed it was flavored with hibiscus, which I am very enthusiastic about, but I couldn't taste the flower at all. Maybe it was in the extremely scant drizzle of sauce under the duck. This meat also was prepared sous vide, and then finished on a hot griddle to crisp up the skin. Crispy duck skin is a rare treat, and is so delicious, Thanksgiving roasted turkey skin gorging seems amateur in comparison. 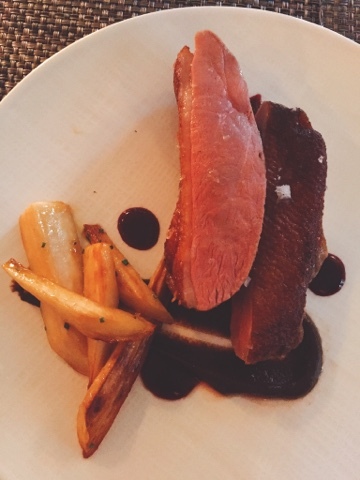 Roasted parsnips alongside the meat added sweetness and a little something extra to the juicy duck overload. We loved this dish, but I confess: I found it a bit simple for the $36 price tag. We had to pay extra for a family style serving of mashed potatoes, but they were excellent: more of a potato purée, silky, buttery, and luscious. Well worth an extra $9, although that's a little extravagant for potatoes. I assume we were paying for fancy butter rather than spuds. I didn't care for the profiteroles I ordered for dessert, as they were a little heavy and the flavors of chocolate sauce and vanilla ice cream on the plate were actually too rich and sweet after that lavish meal. But Melinda's bowl of summer berries topped with a fabulous lemon and champagne sabayon was perfection. The berries were tart and just barely sweet, while the frothy wine cream sauce was light, rich and eggy - this is serious food, and showed more skill and imagination than much of what we ate that evening. Our waitress, Heather, was engaging and professional, never leaving us hanging, but also unobtrusive, letting us enjoy our evening. Her wine recommendations and help with menu questions was spot-on for this level of dining. We had a wonderful evening at The Krebs, enjoying the luxe surroundings and expertly prepared food, but I'm giving it a nine rather than a 10 on the BHS scale. The dishes here are well executed, but missing the assertive flavors and modern touches I felt the interior demanded. This is a five star restaurant, and though all of our food was delicious, the recipes were very, very simple. In instances where the menu led me to believe an ingredient would take a dish to the next level, it never really did. Nothing made us groan or rave with pleasure - it was universally tasty, but just a little bit boring. It could be that this is what the community of Skaneatles demands of its ritzy stalwart, but after having eaten in similarly themed restaurants in DC and Philly, I want just a little more. That said, we quite enjoyed the evening out, and a boozy, pampering dinner in such a gorgeous setting is always a treat. I would go back, for sure. My personality is big, my hunger is bigger! This looks like a meal I'd enjoy a lot. I really love the front porch as a waiting spot too. That front porch was Heavenly. Relaxing in this very old school, Gone with the Wind before the war starts kind of way.